Mark Loves Hunting – In my blog you will find some amazing posts about types of guns, holsters and some tips and tricks related to the same. So, keep on reading! Also you can visit my website for more info. This shoulder holster review will take a look at what a shoulder holster is and why people use shoulder holsters. We will also take a look at some of the best should holsters available and where you can get them. Read our should holster review to learn more about shoulder holsters and what to look for in your search for the best gun holster for your weapon and circumstance. A shoulder holster is a type of concealed weapon holster. Shoulder holsters are designed so that the weapon is protected from view by the arm that covers it. Shoulder holsters don’t require the user to be wearing a belt and are generally more comfortable than a hip holster for someone that will be sitting a lot while carrying the weapon. Many uniformed police officers that work at a desk will carry their weapon in a shoulder holster for this reason. 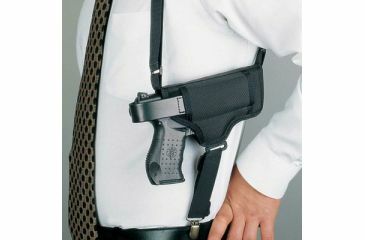 Anyone that wants to carry a concealed weapon on them without having to wear a belt may want to use a shoulder holster. To use a shoulder holster for concealed carry you will have to wear an overcoat that will cover the shoulder holster. This seems to be one of the biggest considerations when choosing to use a shoulder holster. When the weather is cool enough to wear a coat over the shoulder holster it can be a very good choice. When it is hot and you want to wear nothing but a t-shirt a shoulder holster is not very practical. Who makes the best shoulder holsters? There are many companies that make should holsters. In this shoulder holster review we will take a look at the shoulder holsters made by Galco, Uncle Mike’s, and Safariland. First, we will take a look at the Miami Classic shoulder holster by Galco. This is the original shoulder holster made in 1969 and is the one worn by Don Johnson in Miami Vice. This holster has four individual pivot points and a swivel back plate. Make for the best fit for lasting comfort for anyone. This shoulder holster is made of saddle leather and includes the holster, harness and ammo carrier as well as many additional accessories that can be purchased separately. The Galco Jackass Rig System is similar to the Miami Classic but features a more diagonal carry position and adds a set of system screws to the other features of the Miami Classic. The Jackass Rig System is made for semiautomatic pistols and is available for right hand draw. Next, we will look at Uncle Mike’s shoulder holster products. The Sidekick Vertical Shoulder Holster at Uncle Mike’s provides the best weight distribution along with “ultra-snug” firearm retention. This shoulder holster will provide the user with the most freedom of movement while the adjustable buckle and snap retention strap keep the firearm securely in place. Scoped holsters and left-handed shoulder holsters are available. Two other shoulder holsters are available from Uncle Mike’s, the Sidekick Vertical Shoulder Holster, and the Pro-Pak Horizontal or Pro-Pak Vertical Shoulder Holster. Both Pro-Pak Holsters are designed to accommodate your carry and drawing style for fast draw and lightweight comfort. Last, we will take a look at the two Safariland should holster systems, the ALS Shoulder Holster System and the Gun Quick gun Holster. The ALS shoulder Holster System automatically “locks” your weapon into place when you holster your weapon. Simply release the thumb break and then you have a straight draw of your weapon. This shoulder holster is made to be worn in a horizontal or vertical position. The Safariland “Gun Quick” Shoulder Holster is made for medium to large pistols and will fit more than 90 pistol designs. The ambidextrous should holster design allows you to wear the holster right or left handed. This shoulder holster easily adjusts to accommodate different barrel length and widths. Nowadays, holsters can be found in a very wide range of materials. Nylon and plastic models are amongst some of the most common, and the cheapest. However, choosing the right material for you is almost as important as picking the right holster to begin with. There are drawbacks and benefits to each type of material in terms of durability and wear, cost and comfort. Examining holster reviews can help to choose a specific product, but selecting the right material is often the first matter of business. Leather holsters are considered premium options, and this is furthered by those that are made with top grain leather, which comes from a specific part of the animal hide. These types of holsters are almost always at the top end of the cost spectrum, but do have some benefits. Holsters made from top grain leather can and often do last an entire lifetime and they’re incredibly durable. They also can be repaired in the unlikely event that they do need some attention. In terms of flexibility and comfort, many users find them to be the absolute best because they mold nicely and shape to the body well. Be warned, however, some holsters are advertised as leather but are not top grain, they are actually split grain. This is a much poorer quality leather that will often lead to durability issues quickly. Kydex holsters are those that are made from a tough plastic material. 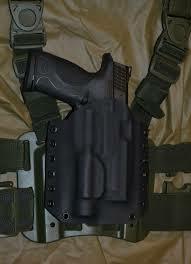 Holsters made from Kydex are quite durable and reasonably priced because the cost of their manufacture is so low. These key elements make them a popular choice because they can last a long time and are very tough. However unlike top grain leather, they offer nothing in terms of flexibility and don’t mold to the body. Hence, some users find them impractical for all day wear especially if a lot of movement is expected. They’re known for a secure hold and solid retention but definitely not comfortable and long term wear. But, given their often substantially lower price point, they remain a very popular choice. It’s important before choosing a holster material to decide what is most important to you. If comfortable and long term wear is valuable, then top grain leather might be the way to go. If value and security are your top priorities, the space age plastic known as Kydex might fit the bill. Regardless, a holster should considered as important of a purchase as the firearm inside to ensure safe and reliable usage everyday if needed.